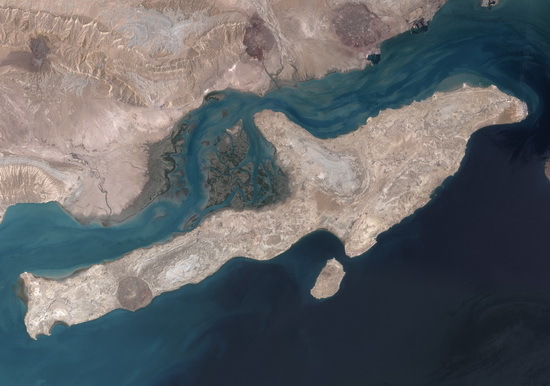 The dolphin shaped Qeshm Island, by far the largest of all islands in this part of middle east ( with more than 75000 inhabitants and more than twice the size of Bahrain or Singapore), is situated about 22 km (13,7 mi) far from Bandar Abbas at the entrance of the Azure waters of Persian Gulf in the strait of Hormoze. It occupies an area of 1500sq km (580 mi). From the Geology point of view, Qeshm Island is on the wrinkled region containing the Zagros mountain range most of whose hills and heights are of the calcareous type with sharp cuts.